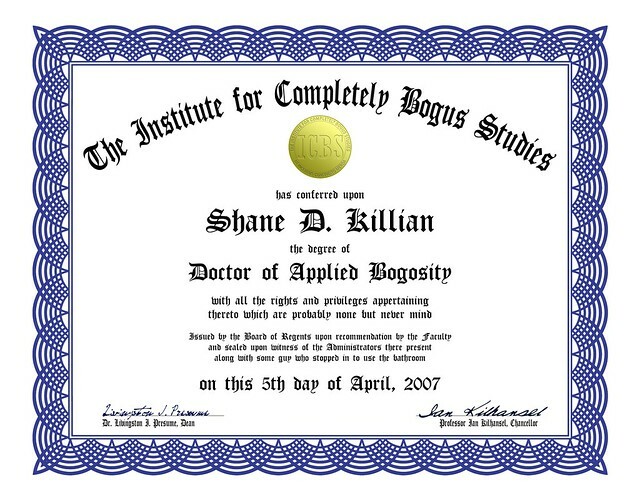 You can now get not one but TWO bogus doctorate certificates from the Institute for Completely Bogus Studies! 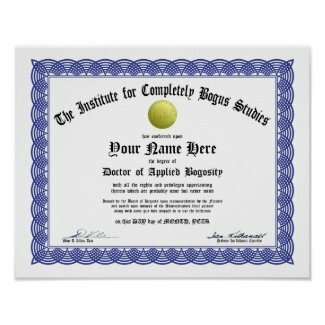 Impress your friends with your very own bogus doctorate degree! The prestigious Doctor of Applied Bogosity and Doctorate of Quantum Bogodynamics from the Institute for Completely Bogus Studies can adorn the wall of your office or practice and impress everyone who doesn't bother to actually read it. In the great tradition of creationists, Law of Attraction nuts, and other fraudsters, you too can speak with the same (lack of) authority. Available at the Bogosity.TV store (click images to go to product page). Re: You too can be a bogus doctor! I couldn't stop laughing. I really want a couple of these. When I get the money, I'm totally buying some. It won't be anytime soon though. Probably somewhere between the Bogosity Episode 10 and Valve's Half-Life 2: Episode 3. Do you get a sonic bogometer with your new title of Doctor? Awesome Do they ship overseas? I dunno; they might have overseas suppliers. It is a big site. so can I get a couple of these, to go along with my upcoming Geology Bachelor's diploma? I dare say they'd be a lot cheaper than your Bachelor's, and I won't even make you pass a test! it's a done deal then! I'll put it right next to my diploma from Thunderwood College, and my Universal Life Church ordination certificate! My favorite thing about the Universal Life Church is that the IRS can't make up their mind whether or not they're tax exempt.